At our worship service, before I read and preach from the Scriptures, I always say something like: “Please open your Bibles and turn to such-and-such a page.” Recently I was struck by how dated and even quaint those words are beginning to sound in a church where a good many people use their smartphones or tablets to read the Bible. They don’t “open” their Bible and “turn” to a page, but they power up their devices and tap-tap-tap! their way to the passage. Electronic Bibles are popular and, from what I can tell, used at worship and Bible studies almost as much as traditional Bibles. I’m not writing this as some kind of woeful jeremiad against this practice (I can see now my congregants in worship, having read this post, furtively lowering their smartphones below the pew’s back when I make eye contact from the pulpit!). I myself have and use Bible apps on my various gadgets. However, I do believe Christians should not rely too heavily on their electronic versions of the Scriptures for their Bible reading and study. 1. The Bible in book form provides vital context for individual passages. There is only one screen on an electronic device. But a Bible in book form consists of hundreds of pages bound together. This means each passage has a definite location relative to the rest of the Scriptures. And the meaning of each portion of Scripture depends, in part, on its canonical context. Think about it: when you read an Old Testament passage in a regular Bible and look up a New Testament cross-reference, you turn forward and, in doing so, you actually follow the flow of redemptive history. But a screen gives you no sense of each passage’s place within the entire Word of God. Passages appear as disembodied fragments with no organic connection to what came before and what comes after. 2. The Bible in book form helps you remember Scripture. Studies show that we tend not to remember what we read on the internet. Is it not reasonable to assume that we don’t retain as much when we read the Bible on a screen? Perhaps I am wrong about that, but from my own experience I find I remember much more what is written on paper than on my Kindle. And, consistent reading from a regular Bible will enable you to locate this or that passage by its physical place in the Bible and its location on the page. So, a Bible in book form helps us to store up God’s word in our hearts (Proverbs 119:11). 2. The Bible in book form testifies to the truth of the incarnation. Words on a screen are airy and ephemeral. But the printed words of Scripture are physical and tangible. This palpable form of Scripture, so lacking in digital display, reinforces in its own way the central truth of our faith: “the Word became flesh” (John 1:14). 3. The Bible in book form reminds us that it is the Holy Bible. When you pick up, hold, and open a Bible, you “feel” this is a sacred book. You treat it as special. But when it shares the same screen as Justin Bieber’s latest tweets, and a picture of your friend’s lunch on Facebook, and “Zombie Gunship,” the Bible somehow doesn’t seem as special anymore. 4. The Bible in book form reinforces the essential historicity of the Christian faith. I have on my shelf some Bibles from my family going back several generations. And I imagine they will be on earth long after I have returned to dust. 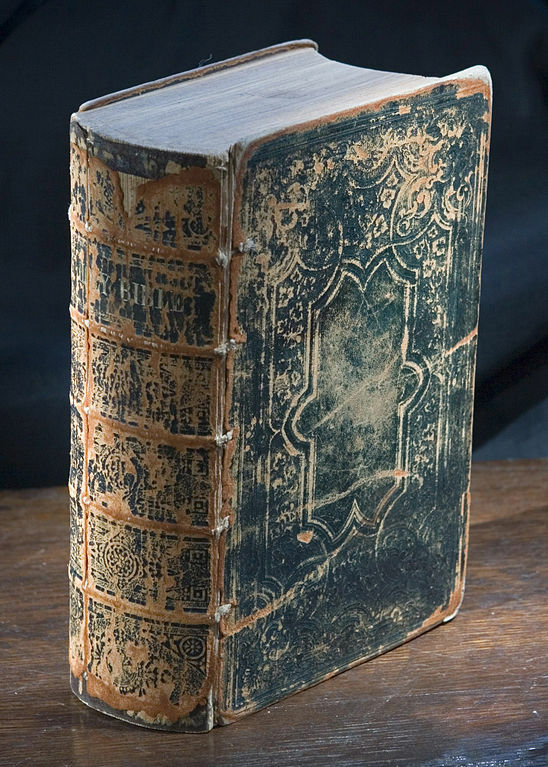 The printed Word of God is durable, and thus it connects us to history. The digital word appears and disappears as quickly as you turn on and off your device. And its form therefore, unlike the printed word, is not consonant with the truth that our faith is grounded in the works of God for us in history. 5. The Bible in book form demands careful reading. When you read an electronic Bible, you naturally bring your electronic reading habits to it. How do you read digital information? You skim it, quickly scanning for bits of information and pushing aside the flood of additional data that pours out from a typical website (admit it, you’re skimming this post!). But this kind of reading is inimical to the sort of sustained thought we are to give to God’s Word if we are to truly profit from it. God wants us to ponder his word, meditate on it, reflect upon it. At least for me, this is well-nigh impossible when reading from a screen. 6. The Bible in book form testifies that God’s Word is weighty, authoritative, and permanent. When God gave the Israelites the Ten Commandments, he wrote them on tablets of stone with his own finger. He chose a medium (rock) that would be consistent with the nature of his Word: imperishable, weighty, authoritative. I suppose God could have written the Ten Commandments with clouds in the air, but they would have soon dissipated into nothing. But that is exactly what happens to the words of Scripture on your screen when you turn off your Kindle or tap out of a Bible app. They simply disappear into a shapeless mass of digital bits. The word cut into stone carries the implicit weight of the carver’s intention; it is decoded into sense under the aspect of its imperishability, It has weight, grandeur – it vies with time. The same word, when it appears on the screen, must be received with a sense of its weightlessness – the weightlessness of its presentation. The same sign, but not the same (pg. 155). Sure, the Bible on your tablet or phone is the same Bible that sits on your shelf, but then it’s not the same. The words are the same, but I fear their power and impact are weakened by the medium. My advice: use your electronic Bible only sparingly, giving far more attention to reading, studying, praying over, and meditating upon, the Word of God in book form.